Malaysia Airlines (MAS) is reportedly looking to sell or lease its entire A380 fleet, as well as four B777-200ERs, as part of its ongoing financial restructuring plan. 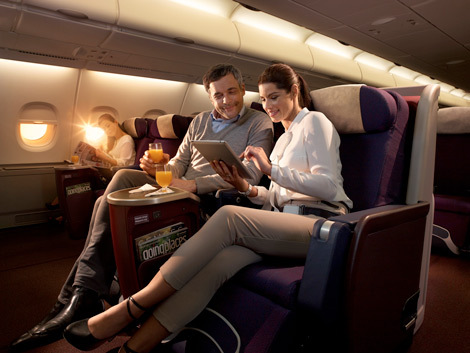 The loss of the A380 in particular would represent a significant setback for passengers, as the superjumbo is the only MAS aircraft to offer fully flat seats in first and business class. However, the decision is not a surprising one, given the airline’s current financial position. Following the tragedies of flight MH370 and MH17 last year, MAS announced that it was heavily in the red (see here and here), prompting Malaysian sovereign wealth fund Khazanah Nasional to take complete ownership of the struggling airline. A new airline head has also been appointed, with former Aer Lingus chief executive Christoph Mueller taking over the reigns last Friday. Part of the restructuring plan, as detailed by MAS, was for the carrier to gradually reduce its long-haul network and concentrate its efforts on boosting regional travel within Asia-Pacific. The sale or lease of its long-haul aircraft would support this theory. As reported by Leeham News and Comment, a media outlet focusing on news involving Airbus and Boeing, MAS has placed all six of its A380s on the market, with two of the superjumbo available for sale or lease effective immediately. The remaining four A380s will be available next year. Meanwhile, the four B777-200ERs are now for sale too, with purchase available immediately. The airline is currently deploying the A380 to London and Paris, and the sale of the superjumbo could signal that MAS is either gearing up to cut those high profile routes, or replace the A380 with its remaining B777-200ER aircraft. Despite offering the range to fly long haul, passengers should note that the B777-200ER does not offer a first class product, while its business class seats are angled, and can therefore not compete with the airline’s nearby competitors such as the likes of Singapore Airlines, Garuda Indonesia, and Cathay Pacific. “Malaysia Airlines seeks to clarify the speculation on its fleet. We are currently still working to finalize the business plan… Exploring fleet options to enhance viability of long haul sectors is one area being looked into,” tweeted the airline.